Many people ask me if I can help them with hypnosis…help them stop smoking or relieve stress..etc… Well my schedule is pretty busy and I’m pretty expensive. But I do have so special hypnotic audio programs that I have made available! In some cases, these work better than if you were to see me in person because, when you see me you pay by the session. Each time you pa me $125 per session. With my audio program you purchase it once and listen to it as many times as you desire. Second, some people are uncomfortable going into a strange environment and experiencing hypnosis with an unknown counselor. Or maybe you know me but getting to me is to much of a schlep? With an audio program you get to experience hypnosis in your home, at your convenience, without any apprehension! I’m happy to tell you that my hypnotic audio programs have helped thousands of people – and I’m also willing to guarantee that they will help YOU! These programs in MP3 digital form usually retail for $9.95 each on my website. However Until may 15th I have them on a special sale! Get all 6 of my hypnosis audio programs that’s right you get all six including, Stress Management, Stop Smoking, Pain Control, Energy and Insomnia, Memory and Concentration and Unlimited Confidence for only $29.95. that is less than $5 EACH! But wait for my Facebook Friends I want to make it even cheaper! 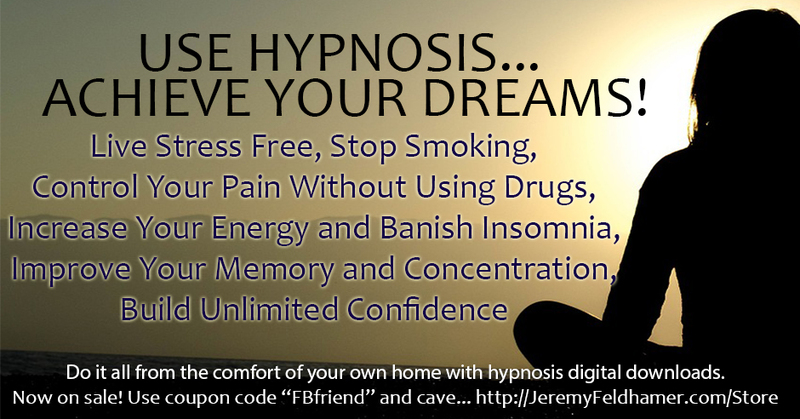 Use the coupon code “FBfriend” at checkout and get all 6 hypnosis audio products for only $14.95! That’s right… only $14.95, but act now because this sale ends on May 15th 2015. In addition to the amazing price you will get my amazing full 90 day guarantee: Download the mp3s, use them, play with it, experience hypnosis and for any reason you have… if you don’t like it, don’t want it or it does not help you achieve your goals, you get a full refund of every penny you paid! How can you beat that offer? click the add to cart button below and use the coupon code “FBfriend” at checkout and get all six programs for only $14.95. Hurry this offer ends may 15th. In this package are the following full audio programs as mp3 digital downloads.